Today MichianaTiming.com became the first sponsor of the new MITCA Website. 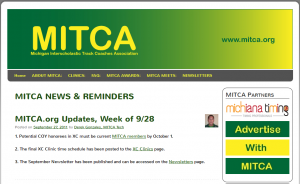 Derek Gonzales, MITCA Tech Officer did a fantastic job of redesigning and improving the site. Long a leader in on-line information, it has been enhanced and so we are honored to be listed as the first “MITCA Partner”. Our company has enjoyed a great relationship with MITCA over the years. Don Passenger, one of our principal members has presented many times on a variety of topics including the use of technology including athletic.net, racetab, Hytek, and many other softwares. MichianaTiming.com has also timed one or more of the MITCA Team State Track Championships for the last 8 years or so and we did the power rankings for the past two years (2010 and 2011) and we look forward to the new and improved format to be followed in 2012.